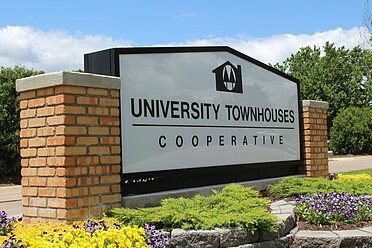 Welcome to University Townhouses Cooperative! A Cooperative is a group of people working together in a joint economic activity that is owned and operated by its members for their mutual benefit. In a housing Cooperative, a housing development is jointly operated by its members. They own membership certificates in the corporation, giving them the right to occupy a dwelling unit and participate in the operations of the corporation. The Cooperative housing corporation owns the total property and is a not-for-profit corporation. A Cooperative is a business controlled by the people who use it. It is a democratic organization whose earnings and assets belong to its members. By patronizing and becoming an active member of a Cooperative, you invest yourself with the power to shape that business. You control the politics and economics of what is truly YOUR organization. When you move in you buy a share (membership) in the Cooperative. The membership fee is $2,800 effective September 17, 2018. THERE IS A WAITING LIST FOR ALL SIZED UNITS. The 2 Bedroom units are available to accept applications until March 1, 2019 when the list will close. 1 Bedroom units & 3 Bedrooms units are unavailable for applications at this time. Please check out the Unit Floorplans Tab for current waiting list information. There is a $75 non-refundable application fee. Applications can not be accepted online at this time however; you can download an application under the About tab. If you have a general comment or suggestion, please email the Management Office at office@universitytownhouses.org. If you have a maintenance work order that you would like to place, please log in to the Resident Portal and place your work order there. Beautiful Cooperative in Ann Arbor. Great place to live! Quiet and beautiful. Located near many schools and shopping.